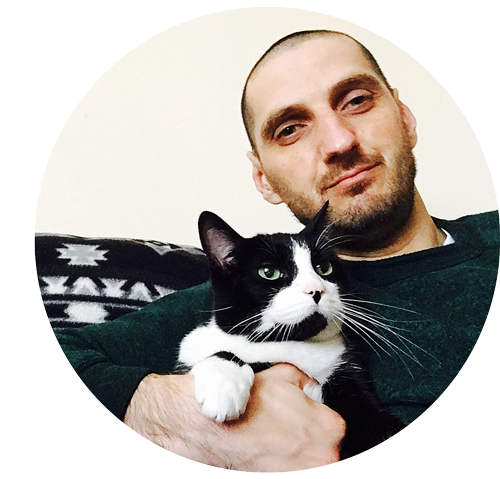 Hello, I am Boris, web and print designer from San Francisco. With each project my goal is to design something that is equally aesthetically pleasing, but also functional and efficient. I will help transform your ideas into thriving and profitable brands. My design career spans over 15 years. Early 2000’s I started my design career at Yoga Works where I designed workshop flyers, schedules, brochures… and also fell in love with yoga practice. When I’m not working on client projects, I am enjoing doing yoga, calligraphy and hiking, or finding new ways to bring more value to my clients. I am big beliver in pratyarpaNa–sanskrit word for Giving Back, therefor I pledged a percentage of my work to pro-bono projects. “All human beings are born free and equal in dignity and rights. They are endowed with reason and conscience and should act towards one another in a spirit of brotherhood.” Universal Declaration of Human Rights. I stand for the rights and freedoms of those in need, those who are threatened, those who are less fortunate… I believe I have a responsibility to use my skills to to protect and amplify the voices of diversity. I pledge to work with one pro-bono client each quarter over the next four years.